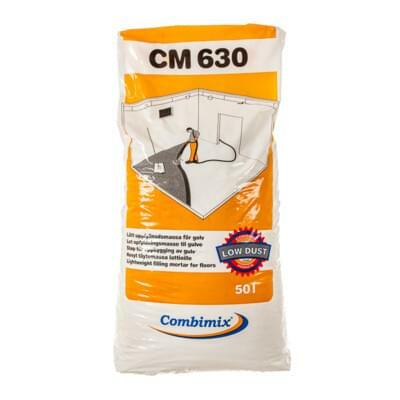 CM 630 Lightweight is a dust reduced flooring product based upon cement and EPS. The product is intended as a lightweight build-up on wood or any firm sublayer that are intended to be leveled with Combimix self-leveling underlayments. The substrate should be clean and free of dust, cement skin, grease and other impurities that may prevent adhesion. In terms of the primer PP 600 forming a film, the temperature of the substrate must not fall below 10 °C. For best results, the ambient temperature in the work area should be between 10 and 25 °C. At higher or lower temperatures, the time for curing will shorten or extend. If it is ment as a floating floor, the subfloor shall be covered with age-resisting plastic before applying the CM 630. The plastic must be covering all horizontal and vertical surfaces. CM 630 is mixed with 7,5 - 9,5 liter of water for every 50 liter bag. CM 630 may be pumped with a special pump. CM 630 is applied evenly on the substrate and a straight-edge is used to get the right thickness. Use a Bull-float to get a good surface. The CM 630 is workable for about one hour. When pumped, the CM 630 might swell up to 15 % in volume afterwards. The newly casted surface may be protected against too rapid dehydration by being covered with plastic, avoiding high temperatures, wind or direct sunlight. CM 630 is ready to be coated with self-leveling after 20–30 hours after casting, depending on temperature and RH. Coating with self leveling: CM 760: Min. 10 mm and no steelnet reinforcement necessary other than in wetrooms. Rest of the 700 series: Min. 20 mm and steelnet reinforcement.